Let's face it. For most holiday partygoers, festive attire adds up to a cozy sweater, a pair of stretchy trousers that allow you to take full advantage of the cheeseboard, and – thanks to every picky host who runs a shoes-off household – a pair of passable socks. But if you have a fancier affair to attend, there's no better season to splurge on a dream frock. In fact, it's an exceptionally indulgent moment in special-occasion fashion, with novelty details, statement colours and bold patterns trumping little black dresses on runways and store racks. Here, Globe Pursuits presents 12 designer options to consider, along with the coats and accessories to take your look completely over-the-top. Photography by Carlyle Routh; styling by Georgia Groom; makeup and hair by Sheri Stroh for Bite Beauty/Oribe/Plutino Group. Model: Aliyah at Elmer Olsen Model Management. Photographed at Clembrook Christmas Farm in Milton, Ont. The prim silhouette of a Greta Constantine gown is elevated with an exaggerated shoulder shape – and the addition of a faux-fur topper. Greta Constantine dress, price on request through www.gretaconstantine.com. Lazy Oaf faux fur coat, $380 at La Maison Simons (www.simons.ca). D Squared earrings, $395, shoes, $1,147 through www.north42.com. Tights, $20 at Nordstrom (www.nordstrom.com). Self Portrait has become a staple label for those with full social calendars. Make winter party hopping a bit more practical by layering a delicate piece under a statement parka. Self Portrait dress, $565, Cheap Monday coat, $170 at La Maison Simons ( www.simons.ca). Simone Rocha earrings, $865 at Nordstrom (www.nordstrom.com). This Miu Miu layer and the ivory slip beneath are for the partygoer who can fearlessly navigate a room full of tipsy guests and their teetering red-wine glasses. Ralph Lauren boots, $1,295 through north42.com. Corey Moranis earrings, $155 through coreymoranis.com. At necklines, sleeves and in jewellery, bow details tie up some of the season's more dandy pieces nicely. Rejina Pyo dress, $1,270, Lewis boots, $245 at Nordstrom ( www.nordstrom.com). Alta Ora earrings, $200 each through @altaora on Instagram. Tights, stylist’s own. What looks like leather and fur is actually pleather and faux, making this Shrimps look perfect for more PC fetes. Shrimps jacket, $1,040, dress, $670, Marc Jacobs shirt, $515 at Nordstrom ( www.nordstrom.com). Forget gingerbread houses and fruitcake. December's sweetest confection might actually be this Molly Goddard piece that layers panels of embroidered silk to decadent effect. Molly Goddard dress, price on request through www.mollygoddard.com. Simone Rocha earrings, $460, Lewit boots (on intro page), $425, tights, $20 at Nordstrom (www.nordstrom.com). Velvet is the season's go-to fabric for updated evening wear. Layering a metallic piece with bright elements takes the look from precious to playful. Ulla Johnson dress, $820 at Holt Renfrew ( www.holtrenfrew.com). Philip Lim coat, $2,245 at Saks Fifth Avenue (www.saksfifthavenue.com). Shoes, $49 at Zara (www.zara.com). Alan Anderson bracelet, $1,600 through www.jewelsbyalananderson.com. Tights, stylist’s own. From bubble gum to fuchsia to the trendy "millennial" hue, rosy shades are ubiquitous in everything from cropped shifts to tailored outerwear. Boutique Moschino dress, $895 through www.north42.com. Coat, $129 at H&M (www.hm.com). Boots, $129 at Zara (www.zara.com). Alan Anderson earrings, $495 to $995 each through www.jewelsbyalananderson.com. The season's shorter hemlines and revealing slits are complemented by a boost to the number of tall boots. The higher you're up for wearing them, the more fashion-forward the look. Andrew Majtenyi coat dress, $890 through www.andrewmajtenyi.com. Boots, $129 at Zara (www.zara.com). Alan Anderson earrings, $995 through www.jewelsbyalananderson.com. Signature Valentino rouge stands out in a forest of evergreens – or a roomful of LBDs. 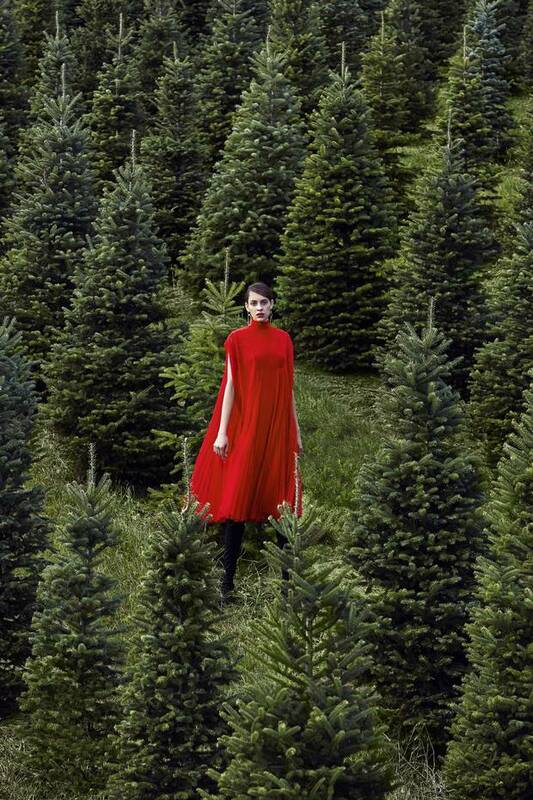 Signature Valentino rouge stands out in a forest of evergreens – or a roomful of LBDs. Valentino dress, price on request at Holt Renfrew ( www.holtrenfrew.com). Boots, $129 at Zara (www.zara.com). Alta Ora earrings, $200 each through @altaora on Instagram. New York-based Proenza Schouler takes the bandage dress in a more contemporary direction by intertwining contrasting bands of colour and accenting the hemline with a subtle frill. Proenza Schouler dress, $3,345 at Saks Fifth Avenue ( www.saksfifthavenue.com). Jacquemus shoes, $795 at La Maison Simons (www.simons.ca). Corey Moranis earrings, $145 through www.coreymoranis.com. Tights, $20 at Nordstrom (www.nordstrom.com). In a collection that mostly emphasized retro influences, the lacy elements of Chloe's fall line stood out with their youthful take on the traditional textile. Chloe dress, $5,200 at Saks Fifth Avenue ( www.saksfifthavenue.com). Simone Rocha earring, $195 at Nordstrom (www.nordstrom.com).